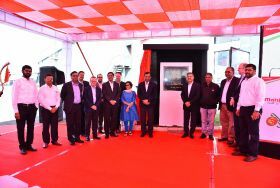 A testament to the ‘Make in India’ initiative, Mahindra Agri Solutions’ new packhouse located in Nashik, in the grape-growing state of Maharashtra, has the capacity to pack 90 tonnes of grapes per day. The 6,900m sq facility has 12 pre-cooling chambers and 280 tonnes of cold storage capacity, utilising the latest technology and sustainable practices. LED lights illuminate the space, and provision for solar power generation has been made to utilise down the track. The packhouse also has storage for up 7m litres of rainwater, and an in-house sewage treatment plant. The new facility, opened officially on 9 January, has been certified by international bodies including the British Retail Consortium, Fairtrade, SMETA (health and safety), SEDEX (data security) and Rainforest Alliance, alongside domestic bodies including Apeda and the Food Safety and Standards Authority of India. Mahindra Agri Solutions CEO, Ashok Sharma said that the packhouse goes a long way in building the confidence of international stakeholders in Indian grapes. “With avant-garde refrigeration, processing and packing technology, this packhouse will enable us to ensure the highest quality supplies as per global standards,” he said. The company said its new facility will be instrumental in maintaining the freshness of grapes through an effective cold chain from arrival at the facility until they reach customers in overseas markets.